Who Are You – I Really Want To Know? 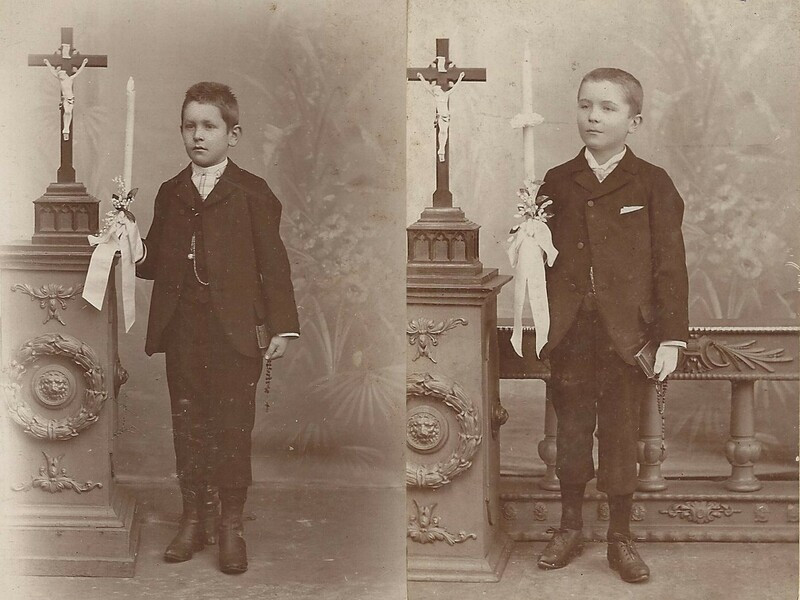 Show us that picture that you found with your family collection or purchased, but have no idea who they might be. The photo has no identifying markings. I obtained it while visiting my cousins in Bavaria. 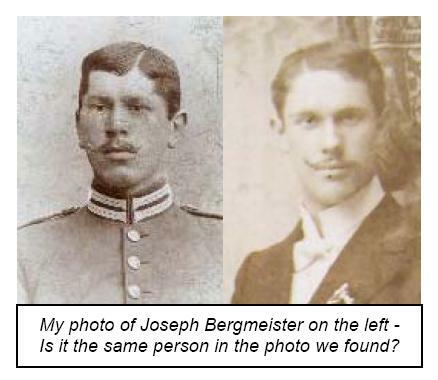 We were searching through boxes of their old, unlabeled photos in an attempt to find one that looked like my great-grandfather, Joseph Bergmeister, who was their ancestor’s first cousin. It’s debatable if we found one or not, but in the course of our investigation my cousin Emilie found this one. She reasoned that it must have been taken in the United States because of the English words, so therefore someone in my family may have sent it back to Germany. Unfortunately, I don’t recognize any of these men. 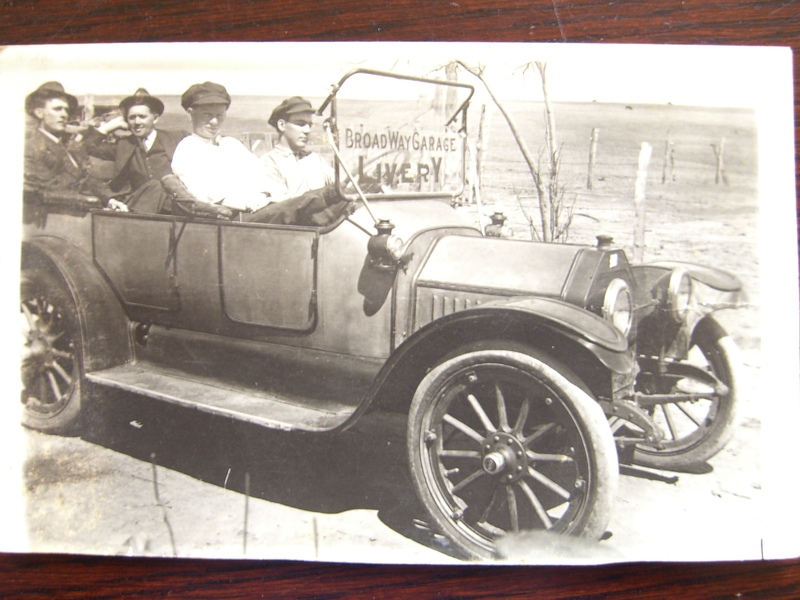 My great-grandfather’s brother, Ignaz, listed his occupation as “driver” in the 1910 Census, but it was for a brewery. On his World War I draft registration card, he indicates he is a driver for “Rising Sun Brewery” in Manhattan. 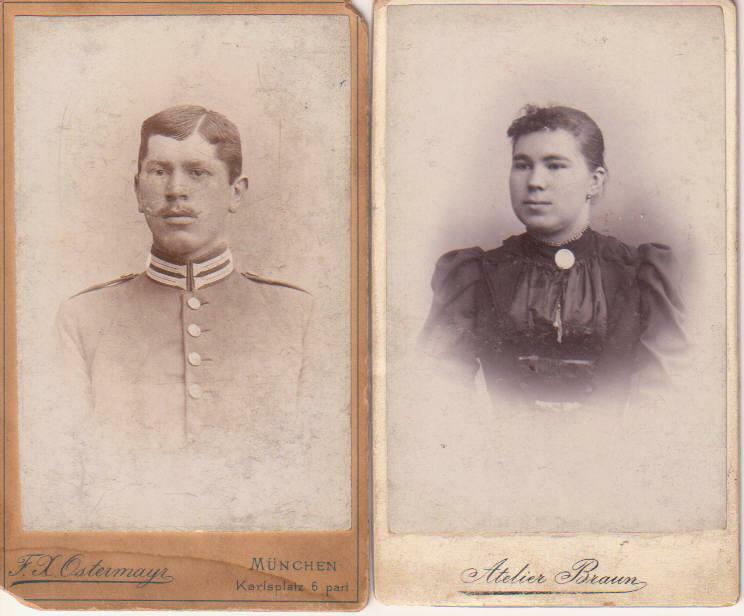 So, although he was a driver, I can’t say for sure if the driver is him since I have no photographs of Ignaz. 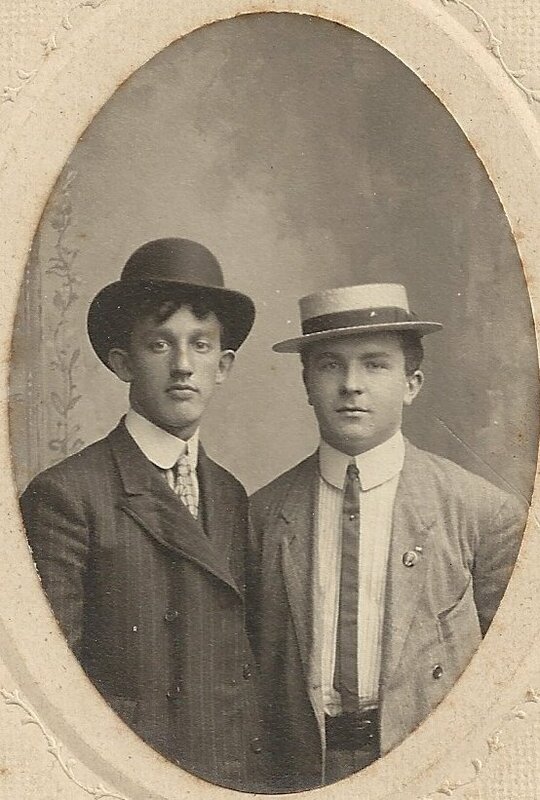 Can the fashions of these gentlemen offer any clues about the time period? Who are you guys? I really want to know! See some of my other Photo Mysteries. Photo Mystery: Is this the same Bergmeister? My only concern is that if the wedding is actually of the Johann Bergmeister, specifically my cousin’s grandfather, then the event took place in 1905. If this is true, then the other man is definitely not my great-grandfather – he was in the United States from 1900 and I have no other passenger record of a “visit” home. Is it Joseph’s brother? 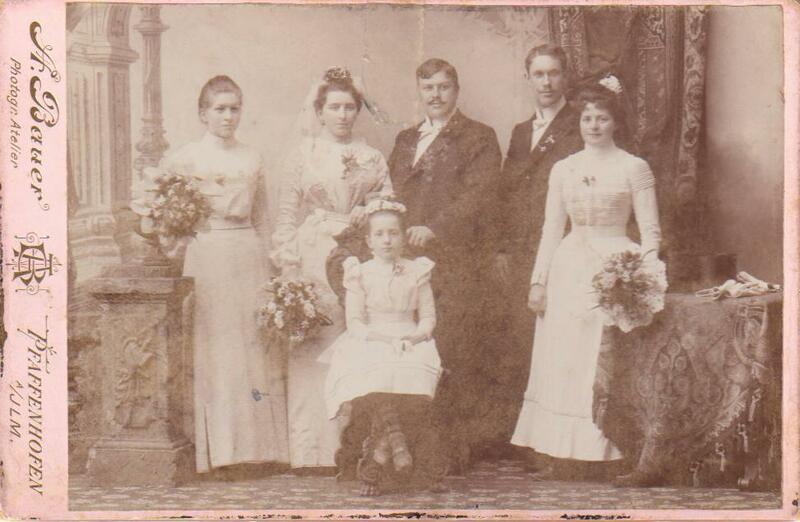 I plan on conducting more research on Bergmeister family weddings around the years 1897-1905 to determine who the bride and groom were in addition to the rest of the wedding party. But, what do you think? Do you see a family resemblance at all? 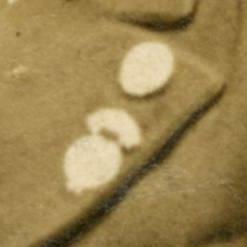 Photo Mystery: What’s the insignia or medal? This photo of my great-grandfather, Joseph Zawodny, is one of two that I am fortunate enough to own. It’s a nice portrait, though slightly damaged – the top of his head missing was not the fault of my talent (or lack thereof) at cropping photos. But what intrigues me the most is what I don’t know – what’s the lapel pin or medal he’s wearing? I’ve tried to enlarge it, but the original photo is not high quality and attempts at enlarging just the pin haven’t made that area any clearer as you can see below. So now I’m calling on all armchair photograph detectives for help – can you solve the mystery? Date: approximately 1914, based on a notation on the back of the photograph, “age 35”. Place of Photograph: taken at “J. Peel” studios in Philadelphia. The photographer had two locations listed, but based on where the Zawodny family lived it was probably taken at the studio at 3060 Richmond Street. Joseph was born in 1879 in Poland in a small town near Dobrosołowo, Konin. He married Waclawa Ślesinska on 28 January 1902 and left Poland two months later, arriving in New York in April, 1902. His wife would follow in 1903, and they settled in Philadelphia to raise a family. Although he was rumored to have served in the military (whether it be the German, Prussian, Russian, or Polish army), I have not found evidence of this in the marriage record. He was only 23 years old when he left Poland. However, could this be a military insignia from one of those armies? He did not serve in the US military, at least not that I have found so far. Another legend puts him in the Merchant Marines, but my grandmother was a good story-teller and enjoyed flash over fact so I’ve put little faith in that one. Could the medal be related to some sort of Polish fraternal society? Joseph was active in his parish, St. Adalbert’s in Philadelphia. He also had an insurance policy with the PRCUA, the Polish Roman Catholic Union of America. He became a naturalized US citizen in 1927 and died in 1944. If anyone has any ideas on the mystery insignia, please leave a comment!